We have sampling in 2010 the early-romantic Van Dam-organ in the Dutch town of Tholen. An organ from Friesland (North NL) in the monumental Church of Zeeland. It is a popular organ for organists who like the Dutch Choralmusic. However, this organ is despite the limited disposition a tool where a lot of music on can be played. The organ in the Church of Our Lady in Tholen was originally built for the “Galileërkerk” in Leeuwarden. This church was demolished in 1940 to make room for a new church. After the Second World War, however, it was decided that the new church was to be built in one of the suburbs of the city, in which the old organ would not fit. 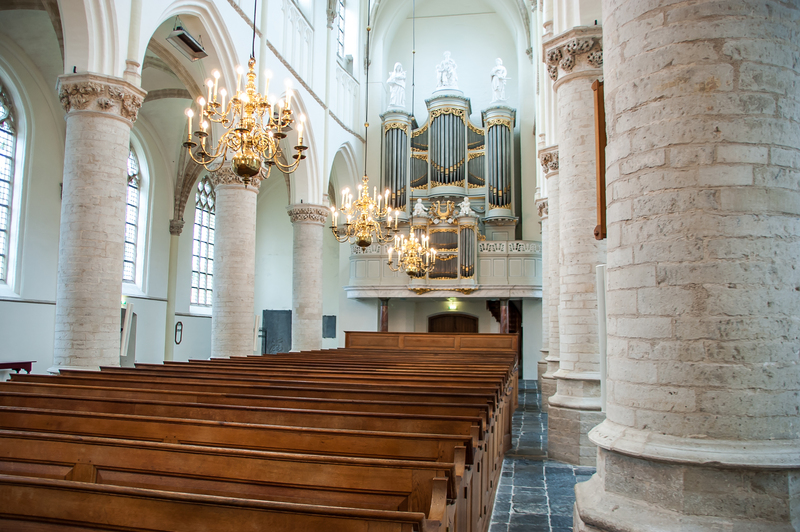 At first the organ was gifted to the Dutch Reformed congregation of Doesburg, which in turn offered it to the newly restored church of Tholen in 1955. The Van Dam organ replaced a two-manual instrument built in 1900 by J. Hilboesen (an apprentice of the Ypma firm in Amsterdam) which was sold to the Old Catholic Church of Rotterdam-Blijdorp in the 1950’s, following the restoration of the church, during which the transept was reunited with the nave of the building (and thus requiring a larger organ as well). The Church of Our Lady in Tholen was able to purchase this historic 3-manual organ, thanks to government mediation, from the Dutch Reformed congregation in Doesburg, which in turn had received the instrument from the Leeuwarden congregation following the destruction of their own 1829 Van Gelder organ in the Second World War. The organ was never installed in Doesburg since the restoration of the church took much longer than expected. In the end, the famous large four-manual Walcker organ was placed there. 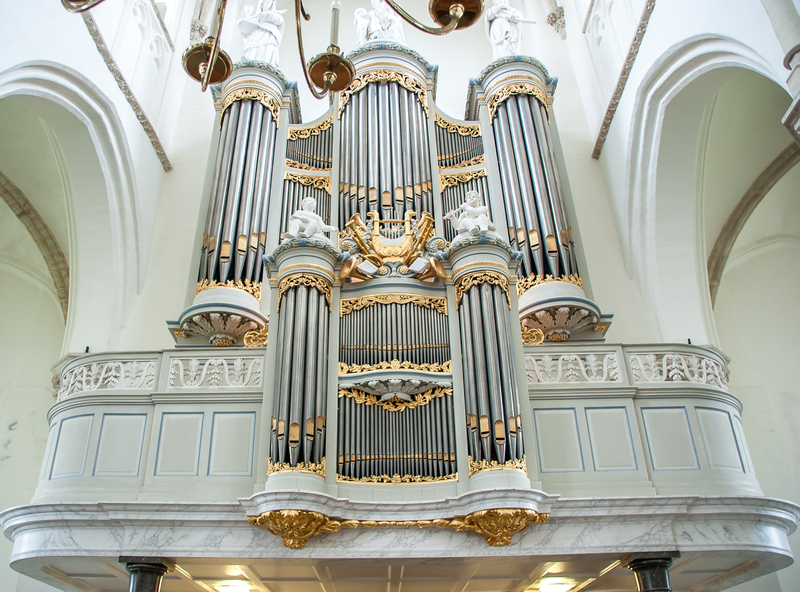 While erecting the organ in Tholen, the organ building firm of J.C. Sanders altered the organ according to the then reigning neo-baroque fashion. The Viola di Gamba 8' and Vioola 4' were changed to a Prestant 4' and Quint 1-1/2', and the Aeoline was replaced by a Regaal. A Scherp III-IV was added to the Rugwerk. Quite a few reed tongues and reed leatherings were also replaced. The four original wedge shaped bellows were replaced by two reservoir bellows. In 1992 and 1993, the organ builder Sebastian F. Blank thoroughly restored the organ to its original state under the consultancy of the late Jan Jongepier. This effectively meant the reconstruction of lost stops, the placement of new wedge-shaped bellows and the reconstruction of the tremulants. The couplers of 1854/1896 were maintained. In 2004, a tremulant for the entire organ was added by organ builder Henk van Eeken. The building of the Tholen organ has a troublesome history. The Van Dam firm clearly had to make a few concessions which did not have their personal preference at all. The three-manual instrument is effectively a two-manual concept in which one manual is spread out over two divisions. In a report from 1854, L. Proes, an expert advisor of the time, considered the organ's Great and Pedal divisions, and also the Choir division, although lacking a reed stop, to be complete. He considered the Swell division (effectively an echo division) to be incomplete and insignificant. In conclusion, he stated that the construction of the organ was a failure. Proes was a proponent of a much larger echo division of which the sound should “however coming from afar, sound tender and have sufficient volume”. The current Echo division he considered “ineffective, pointless and unworthy considering its placement in a large city church”. J.H. Kluiver actually advocated the same point of view in 1976. The purpose of the last restoration was to technically reinstate the instrument and to maintain the historically valuable alterations prior to the work done by J.C. Sanders in 1955. The organ in Tholen is effectively one of the few three-manual instruments built by the Van Dam firm, and the last one of the second Van Dam generation to have an individual Choir division (Rugwerk). The façade of this division shows some resemblance to the famous Silbermann organ of Freiberg and it was this design that formed the base of the façade designs built by the third Van Dam generation and later the Bakker & Timmenga firm who took over the Van Dam company. The Tholen organ is despite, or perhaps even thanks to its rather complicated construction history nevertheless an imposing instrument. The Great's distinctive features are the low tierce Mixture and Cornet (respectively containing a low Seventeenth (3- 1/5’) and a low Twelfth (5- 1/3’) supporting the 16’ harmonic series) make it a dignified division to accompany congregational singing. The small plenum of the Choir (Rugwerk) complements the Great, when coupled, by adding a significant amount of brilliance. Especially its 1' Sifflet and Carillon (containing a unique 4/5’(!) rank), remain audible in a plenum registration. Using the Great to Choir pull coupler (remarkably not vice-versa; one plays on the Rugwerk), added to the organ in 1854, the combined manuals present themselves capable to accompany congregational singing, with or without adding the Carillon and/or Trumpet of the Rugwerk coupled to the foundation stops or even the plenum of the Great. It is quite remarkable however, for this type of organ, that the Pedal division can only be coupled to the Great via the Choir division. Originally no Pedal coupler was planned whatsoever, following the North-German tradition. The uncoupled Pedal division itself provides sufficient balance on its own. Both of its reeds provide a broad foundation. The pedal Trompet, whether or not coupled to the Trompet of the Choir proves to be useful as a solo stop as well. In the sample set three separate pedal couplers have been provided to offer more registration possibilities, and for this reason, also a Rugwerk-Bovenwerk coupler has been added. The coupler to the Echo division (added as late as 1896) however, should be used with caution. It is certainly not meant to be used while playing the full organ, but proves to be quite versatile using softer registrations, especially the beautifully reconstructed string stops and the wonderful Fluit Dolce, with its characteristic ‘sniffing’ sound. The Viola 4' may be used to add some colour to various registrations of 8' or 4' basis. The unusual Dulciaan 8' of the Echo division does need some correction concerning uniformity. It can be clearly heard that this stop has a tendency towards the weak character of a free-beating reed stop. The organ of Tholen was built for the worship service; the accompaniment of the Genevan Psalter. An organ with which you can sign well by and whereby the organist can employ the characteristic Hollandic accompaniment techniques. Additionally, the organ can be employed broadly for the organ literature of, for example, the music of Bach, Mendelssohn, and Dutch choral based romantics like Bastiaans, De Lange and Litzau, to name just a few. On the one hand the instrument is rooted in the classic Frisian organ building tradition of Lambertus van Dam (a pupil of Hinsch); on the other hand several elements of the German early romantic period can be felt. It will be an inviting challenge to seek out the musical boundaries of this instrument.